Dr. Russell Marvin (Hugh Marlowe) is the chief scientist on Operation Skyhook, a US military project intended to send satellites into space to take readings necessary for paving the way for human space exploration; we join him as he’s just returning to the project after marrying his secretary, Carol (Joan Taylor), daughter of military overseer General Hanley (Morris Ankrum), only to find themselves tailgated on the motorway by a flying saucer. 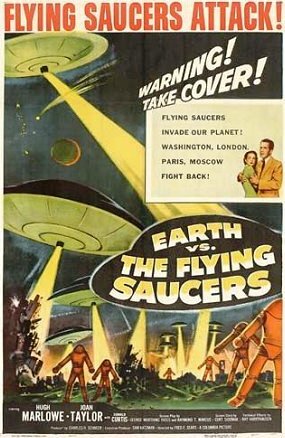 This plays into Dr. Marvin’s worries about the project – in particular, the way each of the satellites launched so far have ended up being blown up – and the next day the aliens actually land at the Skyhook base when the twelfth satellite is about to be launched. The army panic and fire on them, killing one after it steps outside the forcefield surrounding their craft, and the alien retaliation kills over a hundred personnel, Russell and Carol only being saved because they were stuck in the sealed underground control room at the time.